Modern Equipment & Supply has announced the hiring of Chris DeRonde as the division's newest sales team member effective May 16th, 2016. Mr. DeRonde comes to Modern with years of experience in the heavy equipment industry and will cover the company's growing marketplace in The Lehigh Valley and Reading, PA areas. 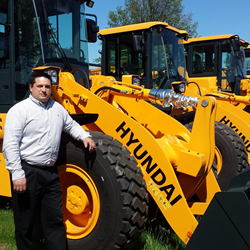 Mr. DeRonde's main focus will be representing the Hyundai Construction line of wheel loaders, excavators, and compaction equipment to customers with wide options for sales, rentals and service of existing equipment. Modern's profile of compact dirt equipment, cranes and bucket trucks, and arborist solutions will also be supported in these markets through Mr. DeRonde's efforts. "We are happy to welcome Chris to our team and excited for what he will be able to do for our customers in Central Pennsylvania" said Rick Nelson, Vice President and General Manager of Modern Equipment & Supply. "The Hyundai product is second to none, not only in quality of build but cost of ownership. With Chris's tireless efforts we will be able to help transform what customer expect out of their equipment investment and the dealer supporting them." Customers can contact Chris DeRonde at Chris.DeRonde [at] moderngroup.com or by phone at 732-674-1067. Modern Group, one of the nation’s leading equipment distributors, provides sales, leasing, short term rental, service, parts, training and financing solutions through its forklifts, power systems, arborist, construction, and warehouse products businesses serving Pennsylvania, New York, New Jersey, and Delaware. For more information visit http://www.moderngroup.com.